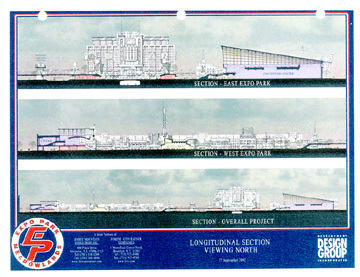 As presented to the New Jersey Sports & Exposition Authority [NJSEA] about October 1, 2002. The presentation included overview of proposals followed by discussions on general land use, convention center, transportation, environmental impact and other concerns. *Late November 2002, the NJSEA selected three semi-finalists with final offers due by December 30. 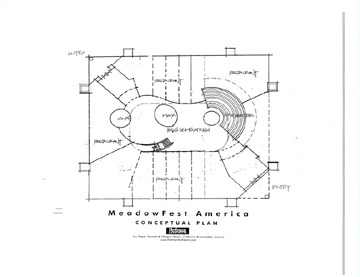 *Expo Park at the Meadowlands -- Forest City Ratner and Hartz Mountain Industries, Inc. 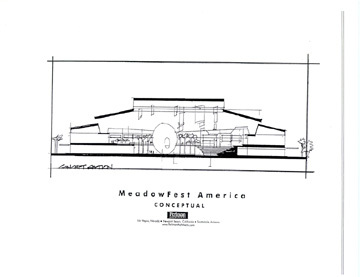 The Westfield plan calls for the creation of an Urban Village, the total experience of a work, play, and stay environment, The Meadowlands Arena Place. 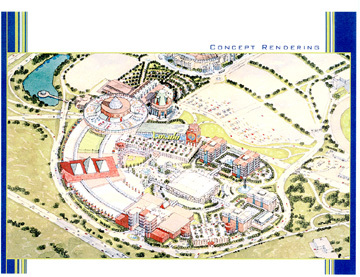 The Arena will be transformed into a live entertainment center that will anchor the development of an urban village, to include restaurants, hotels, offices, retail, conference and exhibition facilities and a town square. Forest City Ratner and Hartz Mountain Industries, Inc. 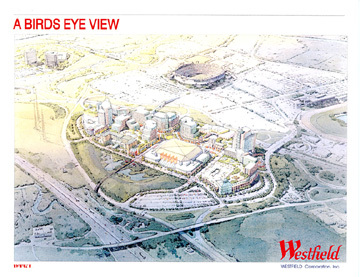 The Expo Park proposal envisions the redeveloped Continental Arena site as a new hub for the Meadowlands and the New York/New Jersey metropolitan region. A diverse mix of uses will be combined around a new 500,000 sf world-class convention center with a pedestrian-friendly streetscape to create a new destination for sports, commerce and recreation. A focal point for travel and tourism, it will attract visitors from the region and across the country. 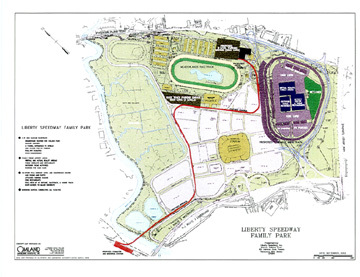 Paul Newman, Carl Hass and Mario Andretti want to introduce New Jersey to the Liberty Speedway concept. 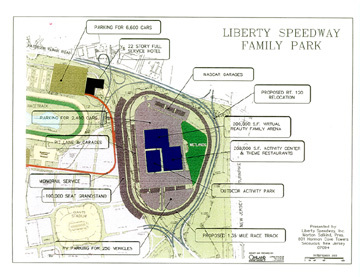 Liberty Speedway would be a world-class auto racing facility with a 1.35-mile course and a 100,000-seat grandstand. 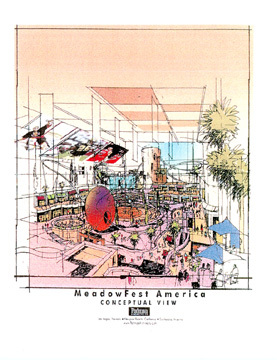 Visitors would be accommodated in a 22 story 440-room hotel tied into a two-mile long monorail. The Liberty Family Theme Park will provide complete family entertainment for the 21st century, including virtual reality racing. 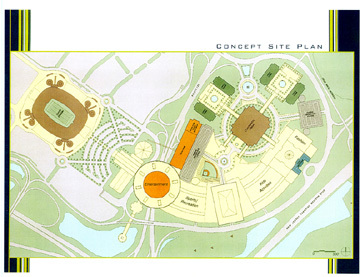 Adaptive reuse of the Continental Arena to accommodate an interactive family environment featuring electronic and mechanical amusement games, entertainment, recreation, science attractions, a mini zoo, a childrens museum, night life activities, with related dining and retail opportunities. 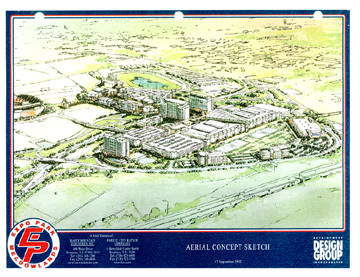 A cutting-edge mixed-use development featuring a state-of-the art ¾ mile Motorsport raceway to be known as the Garden State International Speedway including an 80,000 seat Grandstand. 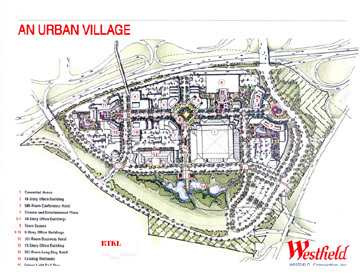 Future phases include a hotel and convention center, a sports-themed entertainment and retail complex, and a commercial office complex. Xanadu is visually compelling multi-use attraction incorporating family entertainment, office, and hotel uses. The diverse components will intensify existing sports complex uses with participatory sports and recreation uses, entertainment and education venues, and complementary leisure uses. 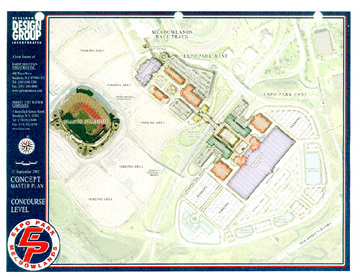 Indoor skiing, indoor surfing, and extreme skate park, Bergen Cliff Hawks minor league ballpark, a creative arts studio for kids, an experimental learning play city for kids, a luxury spa, fine dining, and night life at Xanadu capitalize on existing sports complex uses and introduce new, related and complementary uses to the site.